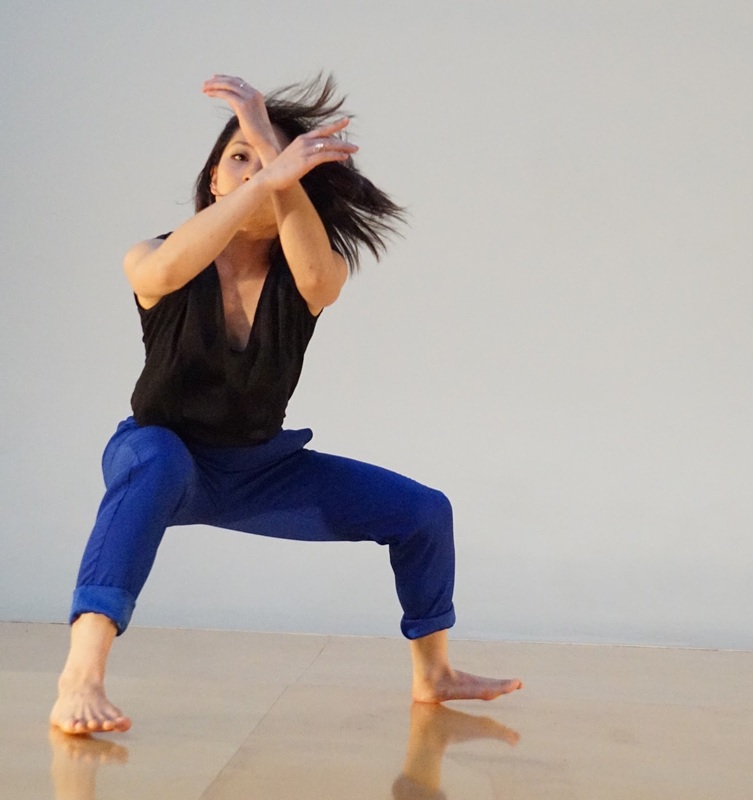 Contemporary artistic perspectives, incisive narrative content and innovative choreographic form/structure, all in an informal, intimate setting – this is Dance Up Close/East Bay. Over the weekend, Shawl-Anderson Dance Center in Berkeley hosted another edition of this wonderful series; a shared program by ahdanco, Jamuna Chiarini and ka·nei·see | collective. Opening the evening was ahdanco’s current work-in-progress, Ink and Feathers, choreographed by Abigail Hosein and danced by Andrew Merrell and Rebecca Gilbert. A long black curtain hung in the center of the otherwise bare environment. Merrell entered the room, stopping downstage left. He stood still, on a diagonal, slowly and methodically pulling a long brown swath of fabric out of his shirt, right from where his heart beat. Still bound and attached to the cloth, he morphed into a movement phrase of large dynamic, living poses; some in deep plié, some on the floor, one standing with his arms outstretched and one with a huge developpé in parallel second. And then, he journeyed upstage and was enveloped by Gilbert from behind the curtain. She emerged, holding a bouquet of balloons. Slinkily, Gilbert cycled through her own solo of sculptural postures and free, circling limbs, carving out and eating up the space. In unpacking her choreographic material, she also let go of each balloon, one by one, allowing them to float to the ceiling. While the two solos happened one after another in sequence, they were keenly connected, and not just because they were in the same choreographic container. Together, they communicated a brilliant duality. Gilbert was releasing her items without hesitation or fear, contrasting beautifully with how Merrell was attempting a separation and was unable (or perhaps unwilling) to say farewell to an essential, inherent connection. In Ink and Feathers, Hosein has crafted a striking work, which considers the complex phenomenon of ‘letting go’ - equally full of uncertainty and constraint, hope and propulsion. I can see why Jamuna Chiarini chose to title her work as The Kitchen Sink. It is such a perfect characterization of the thirty-minute piece. Numerous physical ideas were in play: contact improvisation, familiar task-based movement, pedestrianism, and technique-rich modern release choreography. And there were also common throughlines weaving the dance together. First, a luscious circuitry, or maybe patterning is more accurate, and second, choreographic accumulation and progression. The trio (performed by Chiarini, Megan Dawn and Sara Himmelman) took the space to begin a first circuit. Each dancer sat in a chair near the front of the stage. In their own time, they curved the upper body on the sagittal plane, which took them off the chair and onto the floor. They crawled forward, first on their knees and then with legs extended, and finally to standing and walking. A pattern, to be sure, as well as a concurrent statement of articulation and development. Then The Kitchen Sink diverged into a new and different motif, yet one that still spoke of patterns. Two dancers put on sneakers and started a mirrored walking course, which again, grew and evolved all the way to circular running. Body facings varied and shifted as did intensity, speed and direction. Perspective was center stage in the next circuit. A movement phrase was introduced composed primarily of floorwork, and then was taken off the floor to a new plane, to standing. And throughout all of these unique and mesmerizing choreographic components, the sagittal curve, one of the work’s first movements, was abundantly present. Aside from examining patterns, circuits, choreographic accumulation and different movement styles in The Kitchen Sink, I also felt like Chiarini was posing some profound questions for the viewer to ponder. Where is the body in space? How is it experiencing the space? When more than one body is in the space, what are those bodies saying to each other? Closing this Dance Up Close/East Bay event was Please Don’t, the newest creative project by choreographer Tanya Chianese and ka·nei·see | collective. An ensemble work for five, Mallory Markham, Madeline Matuska, Amy McMurchie, Rebecca Morris and Emma Salmon, Please Don’t delves into weighty and vital subject matter - sexual aggression towards women and imposed, oppressive gender constructs. Lit dimly, the quintet opened with a slow, protective phrase, in which they seemed to be claiming their own agency. But quickly, a switch flipped (in the movement and in the lights) to fully reveal arresting imagery of violating touch. Expressed through abrupt level changes, staccato isolations, extreme extensions, directional pivots and challenging gestures, an array of trios, duets, unison and quartets continued to expose and provoke. While indeed a heavy work, Chianese also cleverly injected moments of humor, like the Dance Theater-inspired smiling sequences. And moments of hope. The most significant observation for me in Please Don’t was the eye towards sisterhood and shared understanding. There were certainly moments when the cast might have been standing still by themselves, but every time they were moving or dancing, it was always in a group formation, whether two, three, four or all five. No one moved alone and that was a potent part of the message. And not to detract from the serious narrative theme, but the technical acuity of the company must be mentioned. These talented dancers have not only sought after their own individual artistic growth but have clearly spent significant energy and effort into gelling as a team. This isn’t a given, and when it does happen or is happening, it is so clear and so powerful.